Black Knight today released its latest Mortgage Monitor report, which revealed 2017 had the fewest number of foreclosure starts since 2000 (649,000), despite the negative impact Hurricanes Harvey, Irma and Maria had on areas such as Texas, Louisiana, Mississippi and Florida. Although 2017 mortgage delinquencies ended at a 23-month high (up 164,000 from 2016 year-end) in non-hurricane impacted areas, the national delinquency rate in those areas was 11 percent below what Black Knight calls “long-term norms.” Furthermore, the total number of mortgages past due or in foreclosure in those areas fell by more than 140,000 — 10 percent below historical averages. 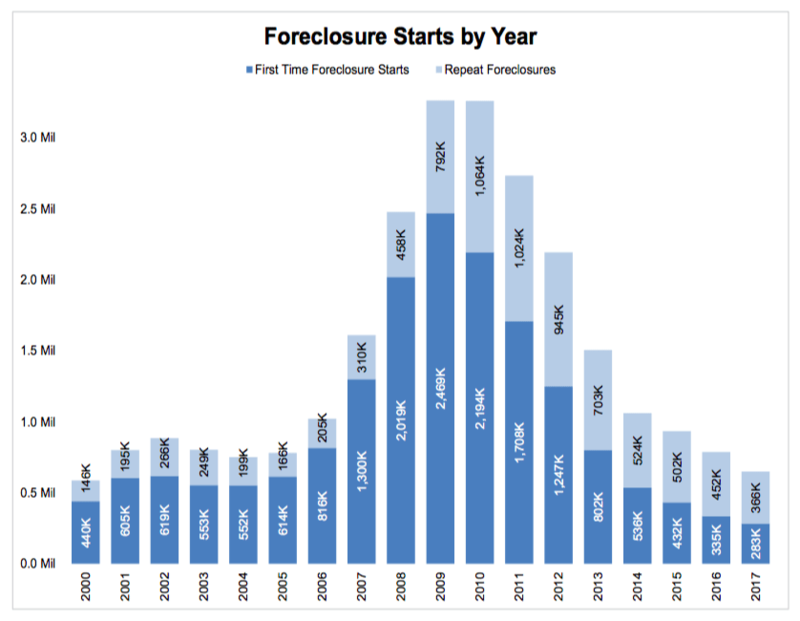 Lastly, first-time foreclosure starts in non-hurricane impacted areas declined 15 percent year-over-year in 2017, the lowest starts on record and roughly half their pre-crisis annual average. Black Knight data analytics executive vice president Ben Graboske says although Hurricanes Harvey and Irma were to blame for the 23-month high in mortgage delinquencies, the moratoria enacted after the hurricanes may have actually had a positive impact. While the hurricanes (obviously) didn’t make much of a dent in non-hurricane impacted areas, they did impact the home equity markets in Florida and Texas. In Irma-impacted areas, the share of past-due second lien lines of credit increased by 117 basis points (+1.2 percentage points) from July to November, and second lien loans increased by 349 basis points (+3.5 percentage points). In Harvey-impacted areas, the non-current rate on lines increased 79 basis points (+1.9 percentage points), and loans rose 378 basis points (+11.8 percentage points). An estimated 17,200 second liens became delinquent as a result of Hurricanes Irma and Harvey, with 5,000 resulting serious delinquencies. The data and analytics division of Black Knight manages the nation’s leading repository of loan-level residential mortgage data and performance information on the majority of the overall market, including tens of millions of loans across the spectrum of credit products and more than 160 million historical records. The company’s research experts carefully analyze this data to produce a summary supplemented by dozens of charts and graphs that reflect trend and point-in-time observations for the monthly Mortgage Monitor Report. Editor’s note: This story has been updated to correct Black Knight’s name. Black Knight Financial Services changed its name to Black Knight in September.